It was a fitting end to a platinum partnership. In her final single with the group that had made her famous, Diana Ross sweetly cooed ‘Someday We’ll Be Together,’ like she was letting the other ladies down easy. It was a gentle, perfect goodbye… too perfect to be true. By October 14, 1969, Ross had been clamoring to become a solo singer for some time. A couple of years prior, it had been Diana who demanded top billing from Motown founder Berry Gordy, and got it – the Supremes started being credited as Diana Ross & the Supremes. Soon, even top billing wasn’t enough, and Ross and Gordy began working on launching her solo career. Eight years earlier, back when the Supremes were still the Primettes, the Detroit duo of Johnny Bristol and Jackey Beavers (who recorded as Johnny & Jackey) had a modest regional hit with a sprightly R&B tune called ‘Someday We’ll Be Together.’ The two had written and recorded this, and other songs, for the Tri-Phi label, which was enveloped by Gordy’s Motown in the mid-’60s. By then, Beavers had moved on to Chicago’s Checker (Chess) Records, but Bristol made his mark at Motown, producing big hits for Edwin Starr, Gladys Knight and Marvin Gaye and Tammi Terrell. In the summer of ’69, Bristol was reworking ‘Someday We’ll Be Together’ for Jr. Walker & the All-Stars, maintaining the original’s hypnotic guitar hook while adding strings, via the Detroit Symphony, and soaring backing vocals that sweetened the chorus. After Bristol had the track nearly completed, Gordy happened to hear it and decided that it should instead become Diana Ross’s debut solo single. The label head requested that Bristol bring Ross in to record a lead part as soon as possible. Ross took a few runs at the vocal, but for whatever reason, the magic wasn’t happening. Bristol later said, “Diana wasn’t in the greatest of moods. I suggested to Mr. Gordy that I go in the other booth and just sing along with her, just a little soulful thing to kind of help.” With Bristol’s harmonizing and gentle words of encouragement, Ross achieved what the writer-producer had hoped for. The only problem was that the Motown engineer had mistakenly recorded Bristol’s vocal part along with Ross’s. This turned out to be a happy accident, as everyone decided the track was better with Johnny’s contribution than without it. 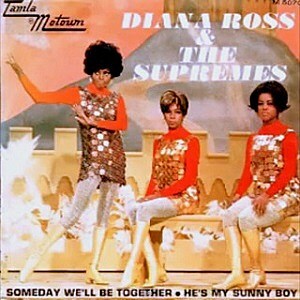 Regardless of who actually sang the song, ‘Someday We’ll Be Together’ was released as a single by Diana Ross & the Supremes in mid-October and the reaction couldn’t have been more positive. ‘Someday’ hit No. 1 on the Billboard charts, becoming the Supremes’ 12th chart-topping smash and the last No.1 hit of the ’60s. Ross performed the song in her last appearance as a Supreme on ‘The Ed Sullivan Show’ in December, and it was the last song she sang with Wilson and Birdsong at a Las Vegas farewell show in January, 1970. Gordy got the big send-off he wanted. Jean Terrell was named as Ross’s replacement and although the Supremes continued to have success, they never scored another No. 1 hit. As a solo artist, Ross fared significantly better than her old pals. ‘Reach Out and Touch (Somebody’s Hand)’ became her solo debut single (and a No. 20 hit) in April, quickly to become eclipsed by her titanic take on ‘Ain’t No Mountain High Enough’ – a No. 1 blockbuster in the summer of 1970. Still, ‘Someday We’ll Be Together’ (which was written years before Ross became a star and, again, didn’t even feature the Supremes) turned out to be prophetic. On the television special ‘Motown 25: Yesterday, Today, Forever,’ Ross reunited with Wilson and Birdsong. You can guess what song they sang. It was perfect.